Yes, I know it's approaching Christmas and I should be posting more pictures of Santa. 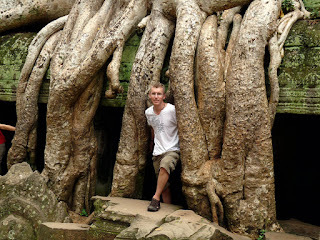 And yes, I know I went to Cambodia a month ago and should have gotten it out of my system. But, I still think about that country a lot and I REALLY wanted to post some of my favourite pictures from my favourite temple. 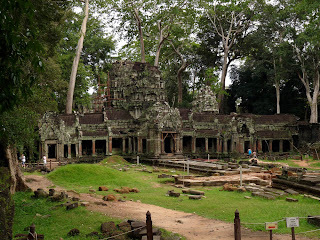 Ta Prohm was built in 1186 and was a Buddhist temple dedicated to good ol' mom; which in this case was the mother of King Jayavarman VII. 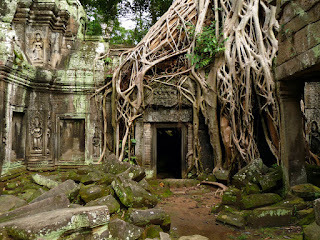 Unlike some of the other temples, Ta Prohm has been swallowed up by the jungle and is mostly in a state of ruin. 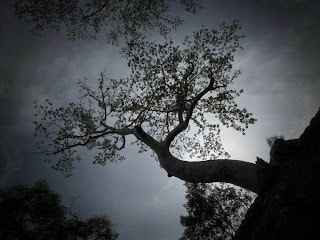 If it weren't for some of the enormous spung trees embracing the walls, I'm sure this place would have crumbled even more. 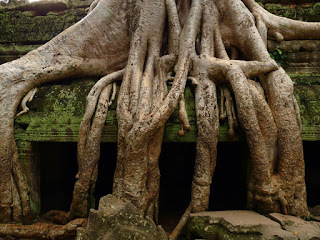 I just finished reading the uplifting book called "First they killed my father" by Loung Ung and in it, she describes how Ta Prohm is where the gods live. I can believe it. Once you step inside this temple, you are transported to another world. 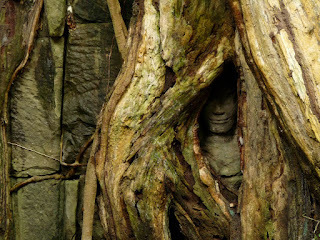 Here is a little Apsara peeking out from behind the roots. 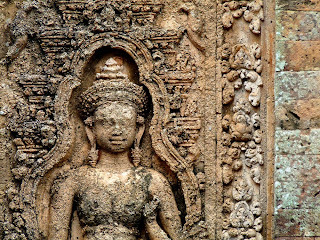 An Apsara is the fabled celestial dancer who is exquisitely beautiful and has alluring charm. In many carvings, she has very large breasts which probably has a lot to do with her popularity. If these pictures look somewhat familiar, it may be because of the movies. 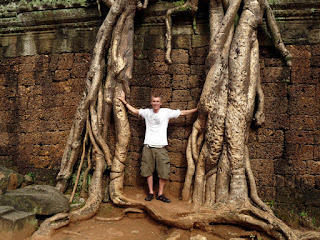 "Tomb Raider" starring Angelina Jolie was filmed here and the guides are quick to point out the "Tomb Raider tree". Who knew that I could not escape Hollywood after travelling thousands of miles? 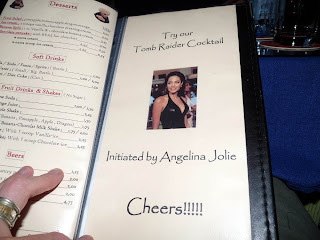 Unlike Angelina, I did not adopt an orphan during my stay in Cambodia and because of that, I do not have a cocktail named after me at the Red Piano Restaurant in Siem Reap. Yes you might say I am a little bitter.